I barely slept on Saturday night and only managed to get about four hours of sleep. Some people can function on that little – I can’t. And I had to laugh. Who has time for a nap in the afternoon? But little did I know JUST how little time I would have for one. I arrived at home in the early afternoon after work, opened the door, and was greeted by seven 15 year old boys. Um….what? 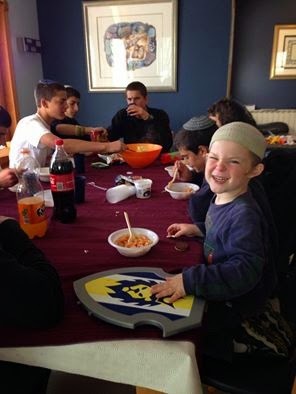 And then I remembered that Matan had told us that their teacher had arranged for six groups of kids to meet up at various houses to work on a project until their bus arrived to bring that back to Sussya at 8:00pm. And so began a hysterically funny, insanely loud and lively afternoon. Before picking Yakir up from school, I raced to the grocery store and bought three bags of pasta, sodas and some cookies. I whipped up a meal for the kids while greeting my own kids at the door as they came in from school. Yakir was in heaven eating lunch with the ‘big guys’. I regret not taking more pictures of the day’s events, but I knew that Matan would be mortified if I were snapping left and right, so I refrained. There were another seven boys working at a house up the block, so at times we had 14 Sussya boys around. And yeah, they got about a half hour of work done together. But that left approximately four hours for Nerf gun fights, electronic helicopter flying, soccer game watching on the computer and jump roping in the house. The kids had planned that they were going to take a hike together, but the weather was quite cold, so they ended up entertaining themselves all afternoon in our house. This guy wasn’t shy about having his picture taken. 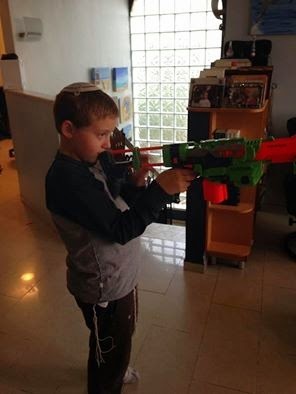 At one point, one of Matan’s friends joined in a coalition with Yakir, and the two tore through the house aiming their Nerf guns at another two kids. “Yakir! 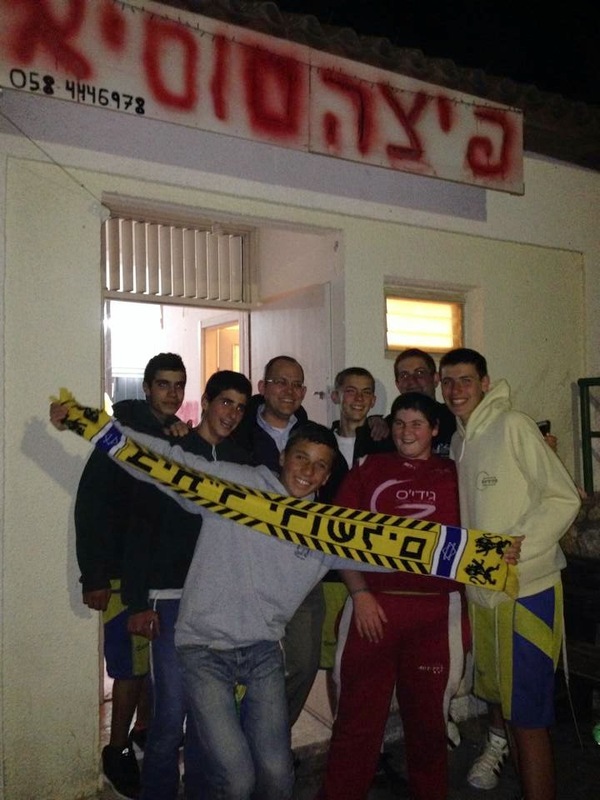 Yakir!” you could hear the 15 year old calling from behind a wall. “Come quick!” And Yakir would fly behind the wall as well to take cover before popping out to riddle their opponents with bullets. Yes, it was one of those days. All I could do was laugh. The kids were all so sweet and well behaved. I did think it was funny when I put out plastic cups for lunch that Matan went into the cupboard to find real cups instead. They are being taught about conservation and the school is incredibly green – I love being one-upped by my son on the environmental front. At 6:30 we finally had to leave because we were driving Matan back to school ahead of the 8pm bus pick-up for a basketball game. It was my first time watching him play on the Sussya team and it was great fun. They won, and then we took him for pizza to the ever-so-elegant tiny little hole in the wall (which may be giving it more credit than it deserves) they have in Sussya. I forced the kids to get together for a picture, before leaving them with the two pizzas we bought for the team and big grins all around. I’m sure my coolness factor doesn’t weigh heavily in his teenage list of priorities at the moment. But it was a joy to watch him interacting with his friends, to see him so happy in his new high school environment, and to fill the stomachs and hearts of his friends for an afternoon.